Turkish yard Vosmarine has delivered a 40 metre sailing superyacht, which was launched on May 11 and named Moss. Built in Antalya under the codename Project Xamura, this steel-hulled ketch features naval architecture by Paolo Scanu and was developed by project manager Bora Paltaoglu. The fresh, modern interiors are courtesy of Turkish designer Emrah Keser, with the layout including five guest cabins and two crew cabins. The star of the show is the main-deck master cabin, which comes with its own en-suite sauna area. Meanwhile, the clean, open deck layout includes two sunbathing areas on the foredeck, a sheltered cockpit, and davits back aft for storing a 50hp Joker tender. The raised aluminium pilothouse contains extensive glazing to allow plenty of light in, and the skipper gets a choice of external and internal helm positions. As well as having a total sail area of 539 square metres, Moss features a single 610hp Cummins QSM11 engine, which can deliver a maximum cruising range of around 1,400 nautical miles at her cruising speed of 9 knots. Key features include a solar panel array that can store enough energy to power all of the electrical systems for up to four hours without relying on the twin 51KW CAT generators. 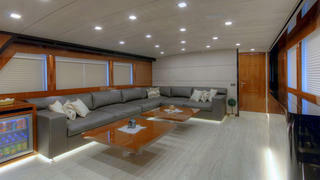 Based in Antalya, Moss is currently available for charter through Prime Servis with rates starting at €45,000 per week. 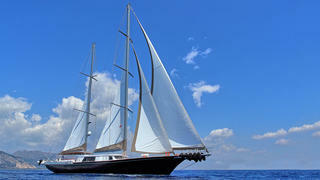 She is also offered for sale, asking €5.75million, and will be going on display at the 2016 Cannes Yachting Festival. Other projects under development at the Vosmarine yard include a 63 metre superyacht, which is due for completion in 2017.